Designed by Patty R. Schuchardt. These speech award stickers are printed on high quality glossy stock. You receive 256 stickers in 32 unique styles. 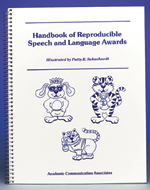 Handbook of Reproducible Speech and Language Awards - Special! 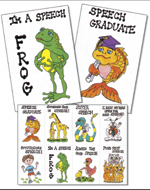 This handy book includes over 100 appealing 8.5"x 11" speech and language award certificates. The certificates may be reproduced as often as necessary. Ages 3through 8. Help parents stimulate language development at home with these creatively-illustrated parent handouts. Motivational Speech Posters- Special ONLINE Discount Offer! This set includes 50 Outstanding Award Certificates. Each award is printed on durable stock. Use these certificates to award special accomplishments. 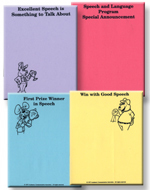 This product includes over 100 speech and language awards. Download the product or obtain the CD. 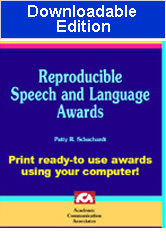 Reproducible Speech and Language Awards (Downloadable Edition) - Special Offer! 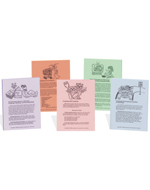 Each of the four pads has fifty 4.25"x 5.5"SHEETS designed specifically for speech-language pathologists.